If you are missing one or more teeth, it’s important that you replace those teeth before too much time passes, and dental implants are the best way to do just that. These extremely strong and durable artificial teeth often last for the lifetime of the patient. Implants are not only a great way to replace missing teeth, they also provide excellent anchors for partials and dentures, allowing the patient to more easily chew food and avoid having to put up with ugly metal clasps to secure their partials. Dental implants are one of many services that Dr. Parma is pleased to provide for this San Antonio, TX, area patients. Dr. Parma has over 20 years of experience in placing implants for his patients. He and his staff utilize the very latest technology, along with surgical guides that are created on a 3D printer to ensure the best placement of the implant. Whether you need just a single tooth replaced or several anchors for your dentures, dental implants are often an excellent choice, and Dr. Parma is the right dentist for the job! 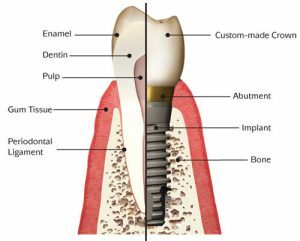 An implant consists of an artificial tooth root made of titanium that is implanted into the jawbone of the patient. After a certain period of time – usually several months – the bone fuses to the artificial root. At that time, Dr. Parma attaches a porcelain crown to the top of the root, and the implant is complete. It’s no wonder that so many patients choose dental implants to replace missing teeth and/or provide anchors for their partials and dentures. The porcelain crown is extremely strong and durable, and because the root of the implant is fused to the bone, this dental appliance is as sturdy as they come. In many ways, a new dental implant is just like getting a brand new natural tooth! For more information about dental implants, or to schedule an appointment with Dr. Parma, contact our San Antonio, TX, office today.